We envision the Town of Lima as an area dominated by agriculture in harmony with a strong natural resource base. Situated between the two communities of Sheboygan Falls and Oostburg, the town does and will continue to provide a safe, quiet country atmosphere with friendly people. To preserve and maintain its uniqueness, careful planning is essential for continued slow, managed growth. The Town of Lima includes two unincorporated villages, Hingham and Gibbsville. Hingham established a church in 1860 and sawmill in the 1830’s. Gibbsville was founded in 1836 by three Gibbs brothers. The Gibbsville post office was established on December 21, 1846. As of January 1, 2007, the Town of Lima had an estimated population of 2,962 and encompassed an area of approximately 22,900 acres. Known for its gently rolling, rural farmlands and country atmosphere, the Town is located in southeastern Sheboygan County, adjacent to the Town of Wilson to the east, Town of Holland to the south, Town of Lyndon to the west, Town of Sheboygan Falls to the north, Town of Sherman to the south-west and the Town of Plymouth to the north-west. 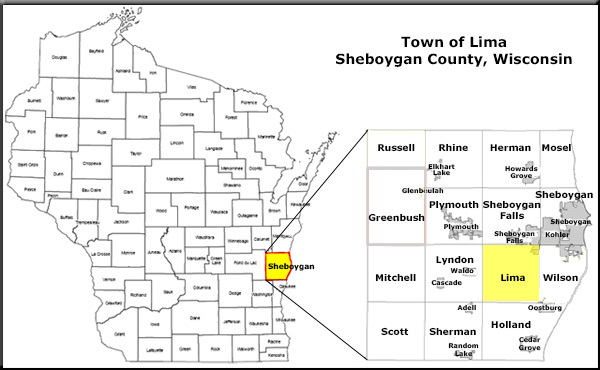 The town of Lima is also adjacent to the Villages of Kohler to the north-east and Oostburg to the south-east, and the City of Sheboygan Falls to the north.